Because finding the best vitamin C powder that can actually work is hard, we decided to review the most popular brands in the market today to find out which of them can actually deliver. The products that made it to the list have been carefully selected and reviewed based on potency, other ingredients and skin benefits. RES﻿SURECTIONbeauty L-Ascorbic Acid Fine Granular Powder is similar to MakingCosmetics Vitamin C Powder in that it's specifically formulated for serums and creams. However, compared with MakingCosmetics, it has a higher level of purity at 99.93%. Most people who have used the powder consider the texture too harsh for the skin. Although it's been tested to dissolve fast, some users still struggled with turning it into the right consistency that's safe enough to use on their skin. BulkSupplements Pure Ascorbic Powder comes packaged in a resealable bag, which helps keep the powder fresh longer. It’s available in different sizes to suit your needs. Philoso﻿phy Turbo B﻿﻿ooster﻿﻿ C ﻿﻿Powde﻿﻿﻿r is the most expensive and smallest product on this list. Its 99.8% vitamin C content is packed in a small amber colored bottle. Although small in size, this powder speaks a lot when it comes to effectiveness. Most of its users have bought the product several times already. WellBodyNaturals Pure Ascorbic Acid Powder, as its name implies, contain pure vitamin C powder. It’s available in 5 different sizes to suit your needs. For something innovative, try Vitabrid C12 Vitamin C Face Brightening Powder. It comes as a powder which you can mix with your skin care products. This product boasts 99.93% purity at an affordable price. Paying for this amount already gets you a 170g small white jar container. 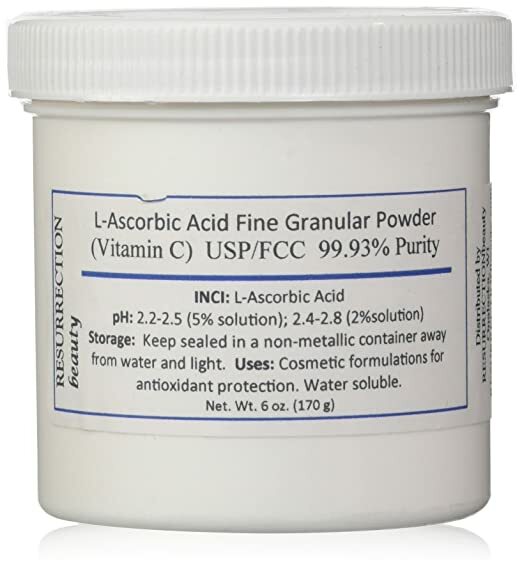 The L-Ascorbic Acid content in this powder is formulated particularly for cosmetic and skin care products. It’s been tested to dissolve in as fast as 3-4 minutes, with intermittent stirring. As a special note before using the product, you should mix it first with either water or witch hazel. Since vitamin C is water-soluble, it’s ill-advised to dissolve the powder in oil-based ingredients. Because it has a granular powder, some users find the product too abrasive for the skin. With a little work, however, it’s possible to turn the powder into the right consistency for skin care use. BulkSupplements Pure Ascorbic Acid Powder comes in five sizes, with its 25kg pack as the heaviest. As the name implies, it’s free from yeast, sugar and other fillers to assure you that you only get pure vitamin C powder. While the product was helpful to a lot of people who used it for a couple of medical conditions, this powder is not intended to use as a means to diagnose. Aside from its health benefits, the product is also effective to use as a stain remover and a buffer to swimming pool chlorine. The powder is easy to mix. Most people who have used it find that the product doesn’t clump up even on very cold water. As for the packaging, it comes in a resealable bag which can help prevent early oxidization of the powder. Users were particularly impressed that the product helped improve the elasticity and texture of their skin. This product has 99.8% high potency vitamin C powder. It’s the most expensive one on our list, considering that for that price tag you only get 7.1 g.
The powder is packed in a small amber tinted bottle which we liked, as it helps retain the stability of vitamin C. The formulation was initially created to manage several skin conditions. However, because Turbo Booster C Powder is now available for everyone, you can easily create your own vitamin C product for tighter and clearer skin. A lot of people actually trust Philosophy’s products to deliver these effects. One thing we noticed about the powder is that it tends to stain fingernails. When taking the product out, we suggest using a pair of hand gloves or simply hold the bottle away from you. The powder works well on healing acne and preventing breakouts, too. Some users who have very sensitive skin didn’t experience any negative reactions from using the product. WellBodyNaturals Pure Ascorbic Acid Powder comes in a foil zip pouch. It contains pure ascorbic acid powder that has been lab tested both for quality and purity. This one is pharmaceutical grade which is great in making serums or as an added ingredient to your face lotions. Its texture is just right- not coarse or too fine. One thing you might not like about this one is its packaging. Since it comes in a pouch, getting the powder out can be quite messy. However, in terms of preserving the potency of the ascorbic acid, this one actually does a great job since its packaging is opaque. Just make sure you don’t fully open the ziplock when scooping the powder out- else you’ll risk exposing the content to degrading factors. Another likeable thing about this one is that it comes in different sizes. You can get this 100-g pack if you would like to test the product out. Or you can get the 5kg-pack. It can save you more and give you lots of powders you can work with. If you are looking for something that’s more convenient to use, Vitabrid C12 Vitamin C Face Brightening Powder shouldn’t be out of your list. It may not contain pure vitamin C but it has a pretty good list of ingredients. It includes adenosine, niacinamide and allantoin. You can also find collagen and zinc oxide in its list. The powder is formulated to be instantly absorbed by the skin. Once you apply it, the product will continuously release anti-oxidant rich vitamin C to your skin for 12 hours. As a result, your skin will get rejuvenated, restored, vibrant and firm. The product can address age spots, wrinkles and fine lines, too. To use the product, you need to shake the bottle lightly to get just the right amount of powder. Add an ample amount of your skin care product, like your serum or moisturizer. Mix the two together and apply well on your skin. Vitamin C is one of those vitamins that humans aren’t capable of producing on their own. Because it isn’t naturally synthesized, you have to find a way to meet your body’s vitamin C demands. While taking supplements can help you reap its best benefits, studies show that topical application of Vitamin C is equally, if not more than, effective as ingesting capsules and tablets. To give you a better understanding of why you should use vitamin C on your skin, here’s a list of its benefits. By supporting collagen production, vitamin C can help improve your skin texture. Collagen is one of the main factors that help create the structure of your skin. Aside from collagen, the vitamin can also assist in the production of elastin. This component is what makes your skin thick, so that it remains hydrated and plump. Because it aids in collagen production, vitamin C can help hasten wound healing process. It also has a depigmenting effect that can lighten up your scars. Vitamin C can increase your resistance against photoaging. It also has the ability to fight the free radicals inside your body as well as the damages they cause. Why Use Vitamin C Powder? Vitamin C products, from creams to serums, are typically expensive. Unfortunately, despite their costs, most of them don’t actually deliver. Some vitamin C products contain too little amount of the vitamin that it’s hard to actually see any improvement in your skin. On the other hand, there are also products that contain too much vitamin C that people who use them experience irritation and adverse reactions. Creating your own skin care products using vitamin C powder allows you to have better control. Because you’ll be able to gauge how strong or weak your formulation will be, there’s little chance you can damage your skin. Vitamin C tends to oxidize quickly when exposed to unfavorable conditions. When it has already undergone oxidation, it becomes ineffective and you’re left with no other option but to throw it out. Vitamin C powder costs way less than commercially prepared products. Also, because you get a large amount of the powder for a fraction of a cost, you’ll be able to make a fresh batch as necessary. Compared with the other forms of vitamin C, its powder form has a lower acidity level which means that it’s not too irritating to sensitive skin. It also has a lower effervescence when mixed with water. Dissolve the powder in 1 tablespoon distilled water in a tinted airtight container. If you prefer to add glycerin, reduce the water to 1 teaspoon and store in the same type of container. Mix all the ingredients in a tinted airtight container. Make sure to check the mixture’s color each time you use it. Any change in color and smell is a clear indication that it has oxidized. Once you see any of these changes, we recommend creating a fresh mixture. If you have dry skin, take 1 teaspoon of vitamin C powder and add it to ½ teaspoon of aloe vera gel. Otherwise, you can just use ½ teaspoon of water. Apply the mixture to your face while avoiding the eye area. Leave it on for around 15 to 20 minute before washing off. Getting beautiful skin doesn’t necessarily have to be expensive. As a matter of fact, with just a single main product, you can achieve the best serums and creams you need to look your most beautiful. Creating your own skin care products has a lot of benefits. Aside from that it can save you money, you’ll also be able to address your skin’s specific needs.